Paul: “I became a minister [of the gospel] according to the gift of the grace of God which was given to me according to the operation of His power. 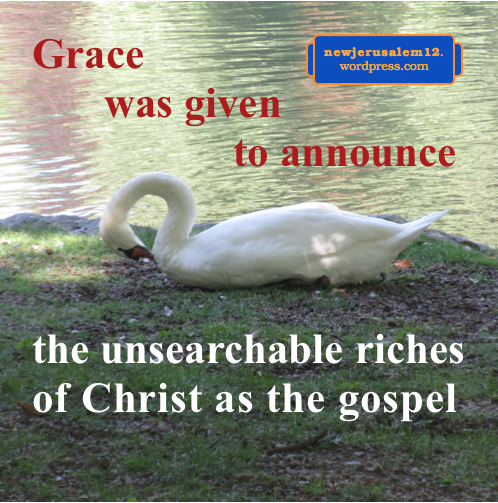 To me…was this grace given to announce to the Gentiles the unsearchable riches of Christ as the gospel” (Eph. 3:7-8). In God’s view the gospel is much more than a response to our need. 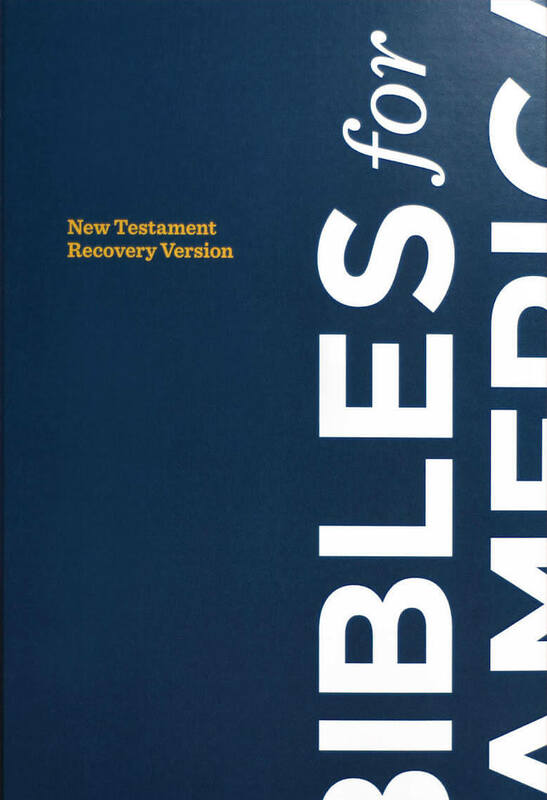 The gospel is to bring us from our fallen condition back to God, to regenerate us with His life, to fully renew us through the course of our Christian life, and to build us together with other believers. This accomplishes God’s eternal purpose, ultimately bringing forth New Jerusalem. For all these steps we surely need God’s mercy and compassion but we also need much more. We need the riches of Christ. God’s intention is to strengthen us into our inner man, our regenerated spirit, so that Christ may make His home in our heart. Then we are rooted and grounded in His love and can lay hold of these unsearchable riches. Eventually we are filled unto all the fullness of God and the outcome is glory to God. This is the gospel presented in Ephesians 3. When we are filled with God, His glory shines out. This is His intention. He is working to fill us day by day with these unsearchable riches. Eventually we all will be filled and New Jerusalem will radiate the glory of God eternally. 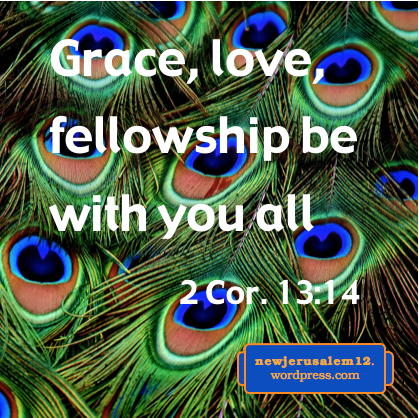 New Jerusalem is the wife of the Lamb, Jesus Christ. Their marriage is in love. Ephesians 1 presents God’s love in the context of His purpose and all that He accomplished. 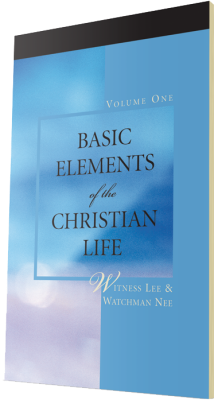 In contrast, chapter 2 begins with us being dead in our offenses and sins (2:1*). Nevertheless, “God, being rich in mercy, because of His great love with which He loved us, even when we were dead in offenses, made us alive together with Christ” (2:4-5). God loved us before creation (1:4), and now, although we are in a fallen creation, He still loves us. Because of this love, God was merciful to forgive us and to make us alive with Christ, to raise us up with Christ, and to seat us in the heavenlies with Christ (2:5-6). This is our salvation by God’s mercy and grace based on His love. (3:16-17). By His making home in us, we are rooted and grounded in His love. This empowers us to apprehend the vast riches of Christ (3:17-18) and “to know the knowledge-surpassing love of Christ” (3:19). In experiencing this love we are “filled unto all the fullness of God” that there may be glory to God in the church (3:19-21). This experiential love, filling, and glory all increase unto New Jerusalem. *Verse numbers are in Ephesians. New Earth is Coming; What to Do Now? God created the earth for His purpose, and allowed Satan and man to corrupt it. God’s purpose in creation is to manifest His unlimited riches and immeasurable wisdom (Eph. 3:8-11). Despite the opposition, God will accomplish this through the church now (3:10) and through New Jerusalem on the new earth eternally. Since the earth will be restored then replaced, what should our attitude be today toward the earth? First, remember that God “created all things…according to the eternal purpose which He made in Christ Jesus our Lord” (Eph. 3:9, 11). We are on earth to live, and let Christ live through us, for God’s purpose. God will “destroy those who destroy the earth” (Rev. 11:18). We should never be among them. We should have a proper, upright human living, as spoken of many times in the gospels and epistles. Thus, we should not damage the earth. On the other hand, we should not be so environmentally conscious and active that we are like those who “worshipped and served the creation rather than the Creator” (Rom. 1:25). “For to me to live is Christ” (Phil. 1:21)—this is the balance in our Christian living. 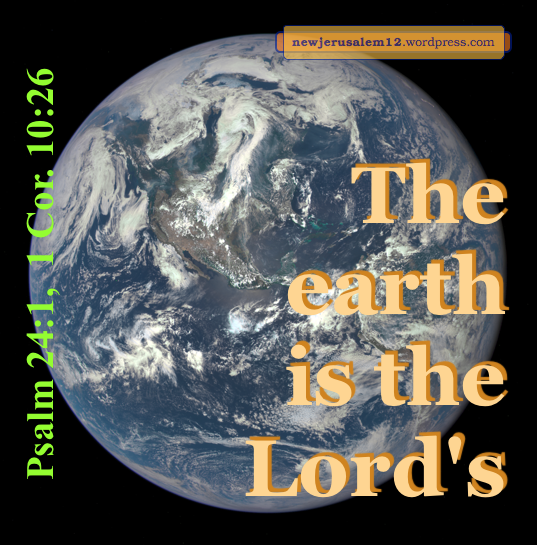 While we are living towards New Jerusalem, we are here living for God’s purpose now, conscious that “the earth is the Lord’s” (1 Cor. 10:26). Christ our life is the governing principle while we are living on earth for the building up of the Body of Christ as the living expression of God, the precursor of New Jerusalem. “God, created all things…according to the eternal purpose which He made in Christ Jesus our Lord.” (Eph. 3:9-11) The ultimate outcome of creation is the new creation with New Jerusalem as the center. 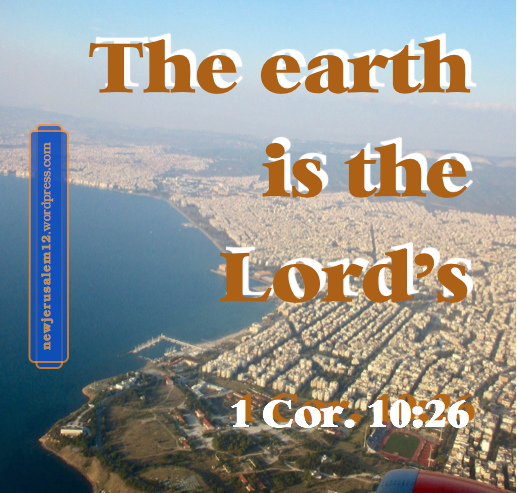 God created the earth and placed man on it for His purpose. However, man fell and was captured by Satan’s system, the world. This problem has become an opportunity for God to demonstrate His unlimited wisdom (Eph. 3:8-11). This demonstration involves many actions, including Jesus Christ dying to redeem us, save us from the world, and give us eternal life. The goal of all of these actions is New Jerusalem, the consummation of everything positive in the Bible. Today we have eternal life in us so that we may cooperate with God to manifest His wisdom through the church on the way to New Jerusalem. Yet, although we are not “of the world” the world still tries to attract us. James warns us, “Do you not know that the friendship of the world is enmity with God? Therefore whoever determines to be a friend of the world is constituted an enemy of God” (4:4). That is serious, but we should not try to avoid the world by our own effort! Peter tells us that God “has granted to us precious and exceedingly great promises that through these you might become partakers of the divine nature, having escaped the corruption which is in the world by lust” (2 P. 1:4). It is by the rich supply in God’s word that we escape the attraction of the world. We need our physical Bibles but must also realize that “the word of God is living and operative” (Heb. 4:12). In coming to the Bible, we open to the Lord so that He may be life to us and operate in us as we read and muse on the written word*. This saves us from the attraction of the world. To be saved from the world is for God’s purpose but the real purpose is that we partake of the divine nature to have it expressed through us on the earth in the church and on the new earth in New Jerusalem. * For more, click on Pray-Reading the Word. God created all things, in order that now His multifarious wisdom might be made known through the church (Eph. 3:9-11) and in eternity through New Jerusalem. This is God’s eternal purpose. 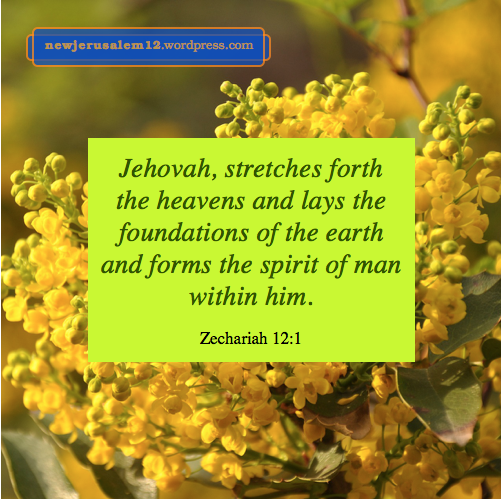 Zechariah 12:1 gives more insight into God’s intention in creation: “Thus declares Jehovah, who stretches forth the heavens and lays the foundations of the earth and forms the spirit of man within him.” Here the heavens are for the earth and the focus of earth is man with a human spirit. Man has a spirit to receive God, who is Spirit. Zechariah tells us that man with a spirit is the key for God to accomplish the purpose presented in Ephesians 3. It is in our human spirit that we are born of God to have His life and be one with Him, without which we cannot be His expression. With this base, when we walk according to spirit, as described in Romans 8 and Galatians 5, the Lord can express Himself through our living. At the same time, the Lord spreads within un to renew our entire being, and thereby enhance His expression through us. One example is Mary: “My soul magnifies the Lord, and my spirit has exulted in God my Savior” (Luke 1:46-47). First her spirit exulted with joy, then her soul expressed that joy. Another example is Paul who spoke of the bountiful supply of the Spirit so that “with all boldness, as always, even now Christ will be magnified in my body, whether through life or through death” (Phil. 1:20). These are individual examples, but God’s goal as expressed in Ephesians 3 is to be magnified in the church today to prepare the way for a richer expression in New Jerusalem. Recent posts touched the change from the created earth at the beginning of the Bible to the new earth at the end of the Bible. The change is necessary because of Satan’s rebellion and man’s fall. But what was God’s original goal in creating the earth? Here is an answer from Ephesians 3, but remember that the Bible eventually shows New Jerusalem as the goal, the completion of everything God does. Ephesians 3:9-11 speak of God’s eternal purpose, a mystery that was hidden throughout the past ages in God, “who created all things, in order that now to the rulers and the authorities in the heavenlies the multifarious wisdom of God might be made known through the church.” This is the mystery of creation. God created everything for manifesting His multifarious/multi-faceted/ manifold/all-various/infinite* wisdom now through the church. This is something of God’s eternal purpose accomplished in time. God’s desire is such a display now! And this display is through His people knit together in Christ, the church. Surely this display will continue into New Jerusalem. Since God had this purpose from eternity, why are there so many problems in the world? It is because God does not force His will on us. He is loving and merciful, but we have a choice. Satan’s deceptions and man’s free will are the source of the problems and degradations in the world. God did not choose to have problems, but He has allowed them. More problems give more opportunity for His wisdom to be manifested in overcoming them. The proper church today shows, and eventually New Jerusalem will fully show, that God’s wisdom is greater than all the evils and failures in humanity. * Various translations in Ephesians 3:10, thanks to Bible Hub. 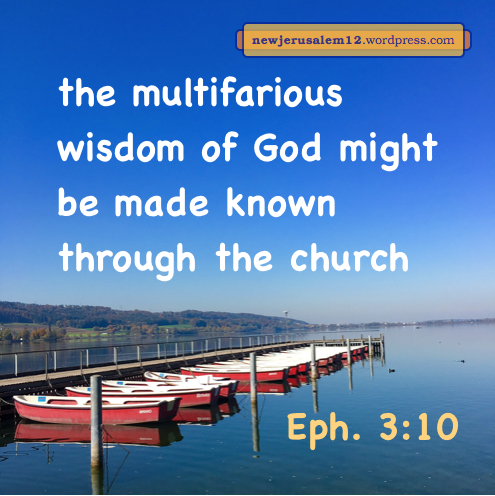 More about God manifested through the church per Ephesians 3. Genesis 1:1 records the creation of the earth and Revelation 21:1 records the coming of the new earth. Between these two milestones are many downward turns from Satan’s and man’s rejection of God, but God is not defeated. He will gain the new heaven and new earth with New Jerusalem to fulfill His desire. 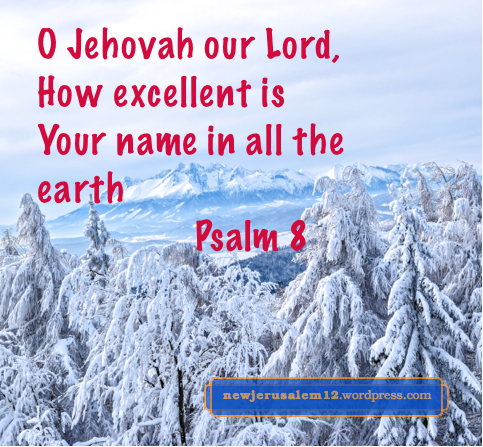 Psalm 8 begins and ends, “O Jehovah our Lord, How excellent is Your name in all the earth.” Humanly we don’t yet see this. However, the psalmist, inspired by the Spirit, looked forward to the outcome of all that Christ would accomplish. Verses 4-6 of the Psalm are quoted in Hebrews 2:6-8 in regard to Jesus Christ. “We do not yet see all things subjected to Him, but we see Jesus.” Although we do not yet see all things subjected to God, we do see the incarnated, crucified, and resurrected Jesus (Heb. 2:8-10). He is now one with all His believers, His brothers, and is sanctifying us inwardly to match Him (v. 11). He is also singing praise to God our Father in the church (v. 12). The path to new earth and New Jerusalem is not only through incarnation, crucifixion, and resurrection, but is also through the church. The path in Psalm 8 and Hebrews 2 corresponds with Ephesians 3:8-11: God created all things so that, according to His eternal purpose, through grace the multifarious wisdom of God might be made known to the heavenly rulers. This requires that Christ make home in our hearts through faith, resulting in further growth in us (3:16-19). This is His heading up of the church, which is the first step of heading up all things in the heavens and on earth in Christ (1:10). By heading us up, God will gain glory in the church (3:20-21). The further heading up of all things will bring us to the new earth and New Jerusalem. The Lord Jesus, at the beginning of His ministry, read from Isaiah about Himself, “The Spirit of the Lord is upon Me, because He has anointed Me to announce the gospel to the poor…” (Luke 4:18). The poverty in this verse can certainly be understood physically but should also be viewed spiritually. The Lord Jesus came to announce Himself to people who are poor spiritually, whether rich or poor humanly. What does this have to do with New Jerusalem? Simple. God’s riches bring us out of spiritual poverty all the way to New Jerusalem. 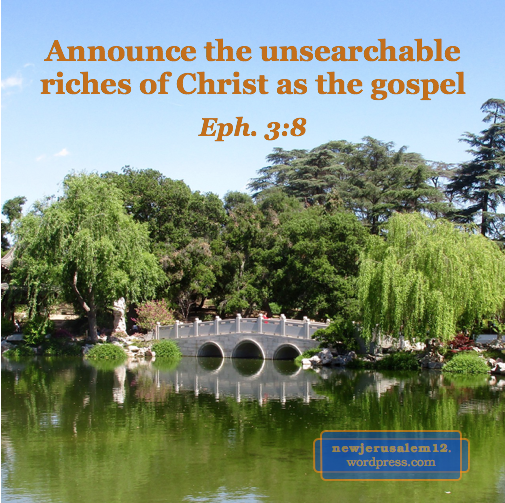 In Ephesians 3:8 the unsearchable riches of Christ are the gospel announced by Paul. The goal of the gospel is not to save people from poverty but to impart these unsearchable riches into people. As a byproduct people are saved from spiritual poverty. In Romans 2:4 “the riches of His kindness and forbearance and long-suffering” lead us to repentance. This is the beginning of our journey—to repent, turn to God, and receive Jesus Christ. Here three aspects of God’s riches lead us to repent and to enter the path to New Jerusalem. This repentance is one aspect of the rich gospel. Ephesians 1:7 tells us that in Christ Jesus “we have redemption through His blood, the forgiveness of offenses, according to the riches of His grace.” We certainly need forgiveness, but the measure of God’s action is not our need but His riches. This forgiveness is another aspect of the rich gospel. Romans 9:23 tells us God will “make known the riches of His glory upon vessels of mercy.” We need mercy to bring us out of our poor condition, but God does not emphasize that poor condition. His mercy is shown, not because we are pitiful, but to gain us as vessels to display the riches of His glory. Eventually New Jerusalem will be a great corporate vessel displaying His riches. From incarnation, in Jesus Christ “dwells all the fullness of the Godhead bodily” (Col. 2:9). From resurrection and ascension the church, His Body, is “the fullness of the One who fills all in all” (Eph. 1:23). Eventually New Jerusalem will display the fullness of the Godhead. The Body of Christ is the fullness now. Nevertheless, we need to experience much of God’s operating to enter into this reality. Paul prayed for this in Ephesians 3. He said, “I bow my knees unto the Father,” (v. 14) for us to be brought through four stages of experience. There is no question about glory in New Jerusalem eternally. But, for glory in the church now, we need to echo Paul’s prayer, Father, strengthen me into my inner man today. Strengthen us that we may be filled for glory to You in the church now. God is able! To him be the glory.